WOW! 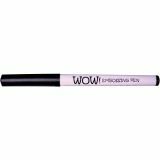 Embossing Pen - WOW EMBOSSING POWDER: WOW! Embossing Pen. Add a personal, embossed touch to your stamping project. This clear embossing pen will allow you the freedom to add freehand designs or words to any project. This package contains one clear embossing pen. Acid free. Imported.